One of the biggest advancements in the new iPhone XS, XS Max, and XR is the dual SIM functionality that will let you use two cellular networks at once. Like Sinatra, however, Apple is known to do things its own way, so their dual SIM setup is a bit different than you might think. All three 2018 iPhone models are dual SIM, just not in the way that most of us imagined. Traditionally, smartphones that feature dual SIM capabilities literally had two SIM card slots to enable the use of two networks. Apple, however, took a different approach, and engineered its flagships to utilize only one nano-SIM card and paired it with embedded SIM, or eSIM, for short. That said, Chinese variants of the latest iPhones will come with the traditional double nano-SIM slots, giving customers there the ability to activate two lines more easily. For the rest of the world, creating a second line via eSIM is only possible in iOS 12.1 or higher. Embedded SIMs, sometimes referred to as electronic SIMs, are not that new to the mobile world. Android devices like the Google Pixel 2 and Nuu Mobile X5 have utilized the technology as a viable alternative to physical nano-SIMs to store your phone number and carrier-associated user data. Apple has even used eSIMs in select devices like the Apple Watch 3 and select iPad Pro. The eSIM is a non-removable chip that's built into the new iPhones. When you activate this chip, it works just like a physical SIM, which the new iPhones also have a slot for (hence the dual SIM aspect — one removable and one embedded). As an added bonus, you can store multiple eSIMs in your iPhone, though you can only use them one at a time. At this point, we're still uncertain as to how many total lines you can program into an iPhone's eSIM. Of course, we'll revisit this once we find out more. Because it's embedded within your iPhone's hardware in the form of a microchip, eSIMs leave a significantly smaller footprint on your device's logic board when compared to a physical nano-SIM and all its associated hardware components. This lessens overall costs, which may partially play a role in why the iPhone XR starts at about $950 in China, compared to $750 in the US. You may feel a little uneasy about using an eSIM to store your line, as it seems like a way to lock you to your carrier and make it harder to switch to another company for better service. This isn't the case, however, as transferring your line from one carrier to another via your iPhone's eSIM will be as easy as switching W-Fi networks. In fact, the technology behind eSIM is so disruptive that major carriers like AT&T and Verizon have been put on notice with the US Justice Department opening an inquiry in early 2018 to determine if the companies colluded with GSMA to thwart eSIM development and adoption. The investigation centers around their alleged attempt to influence mobile technology to hinder innovation and maintain dominance. What Carriers Support eSIMs in iPhones? Because of the general lack of infrastructure necessary to support the iPhone's dual-SIM functionality using an eSIM, only a handful of major carriers spanning ten countries offer eSIM support on iOS 12.1 or later. AT&T and Verizon Wireless both support eSIM use, while T-Mobile will be rolling it out soon. For info on other carriers, stateside or abroad, check out our list of eSIM-supported carriers. To reiterate, variants of the iPhone XS, XS Max, and iPhone XR that feature the standard dual nano-SIM setup will only be available in China, Hong Kong, and Macau. As mentioned before, the ability to activate a line using an eSIM — whether primary or secondary — is only available in iOS 12.1 or higher. Because of this, you probably have already set up your iPhone using the traditional nano-SIM method, thus designating the number associated with the nano-SIM card as your primary line. However, creating a secondary line using your iPhone's eSIM is easy enough. Just bear in mind that your iPhone will have to be SIM-unlocked if you want to use it with two different carriers. Otherwise, you'll have to activate a second line using the same carrier. Also, you can only use GSM plans if your iPhone is already on a GSM carrier or a CDMA carrier. You can't add a secondary CDMA plan if your current plan is CDMA-based. That said, it should also be possible to transfer your primary line out of your nano-SIM and reprogram it into your iPhone's eSIM to free up the SIM card slot after you've activated the phone. This will enable you to use the physical SIM card slot when traveling or switching to a network that doesn't support eSIMs. 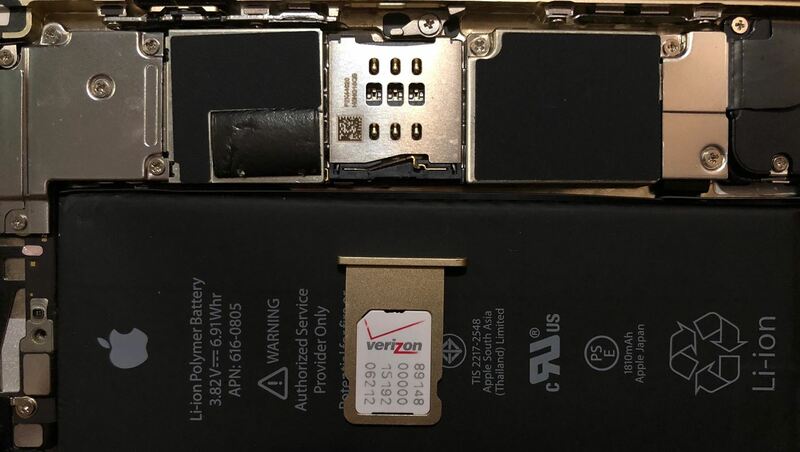 Note that when you move a line from a physical SIM to an eSIM, the old physical SIM card will likely stop working. For the full details on adding and activating a line on the eSIM, as well as more details as to how it works and what you can and can't do, check out our full guide. It's worth noting that as mentioned above, you can store more than one eSIM in your iPhone, but you can only use one eSIM-based line at a time. To switch eSIMs, you'll first need to go to the "Cellular" page within the Settings app. From there, select "Cellular Plans," tap on the plan you want to use, and hit "Turn On This Line" to set the number for use. With two (or more) active lines, you'll be able to make and receive voice calls and send and receive regular text (SMS) and picture (MMS) messages, though you'll only be able to use one cellular data network at a time for internet-based services like FaceTime, iMessage, and Safari. The iPhone XS, XS Max, and XR handle having two active lines in a straightforward manner. They use your designated default number to make or receive calls to contacts you haven't phoned yet. You can manually opt to call a contact with your secondary number, and if you do so, your iPhone will automatically use that number to communicate with that contact moving forward. Apple will let you freely set which phone line to associate for each contact through an option found within his or her info page. You'll also be able switch phone numbers on the fly before making a call by tapping on the "Primary" button within the dialer app, then selecting the line you want to use from the prompt that appears. If you're calling a contact in your Favorites list, swap numbers by hitting the blue information button on the right, then tap on your current phone number and select your other number once it appears. It's important to note that when you're on a call, any incoming calls on your second line won't trigger call waiting, and instead, they will go straight to your voicemail (if you have one set up). More importantly, you won't receive missed call notifications for any incoming calls on the second line due to a current call on the other. Because of this, we highly recommend setting up call forwarding to reroute calls between your two lines to avoid missing any important phone calls. Besides that, call waiting and missed call notifications will still function as normal when received on the same number as your active call. For iMessage and FaceTime, your iPhone XS, XS Max, or iPhone XR will use the cellular data from the phone number you assigned as your default line. Like with phone calls, you'll be able to switch lines at any time through an option found within the "iMessage" and "FaceTime" pages in the Settings app. If that weren't enough, you can also change numbers within the conversation box inside the Messages app, by hitting the blue "Primary" button seen in the screenshot below. As mentioned before, the iPhone XS, XS Max, and XR will only let you use one line at a time with regards cellular data, unlike phone calls, SMS, and MMS texts that are active for both lines. You can change which line you want to use for the internet at any time simply by going to "Cellular," then "Cellular Data," inside the Settings app. In addition to that, you can also access either the "Primary" or "Secondary" tabs under the "Cellular Plans" section within "Cellular" in the Settings app to enable or disable cellular data for each line. Please note that, according to Apple, your cellular data will not work whenever you're on an active phone call on a line you didn't designate as your data number, so you'll need to make that line your data line while on a call if you want the internet to keep working. Obviously, this can be problematic if you're traveling and using Apple Maps to navigate to your destination.